At the Fred T. Korematsu Day celebration in San Francisco on Sunday, most of the honorees had passed on and were represented by their scions. But I managed to sit next to one of the originals, 98-year-old Mabel Fong. If you’re Asian American, you likely know Korematsu — the man who fought the U.S. government’s internment of Japanese Americans all the way to the Supreme Court. If you don’t know Fong, I don’t blame you. I didn’t either until I sat next to her. Fong was one of the members of the 1938 National Dollar Store strike in San Francisco, a strike against sweatshop conditions and low wages for garment workers in the city’s Chinatown. The strike ended when white retail clerks at National Dollar refused to cross the Chinese workers’ picket line. Not only were conditions improved in the factories, but a racial barrier was broken in the city’s retail stores. Chinese Americans like Fong got hired. 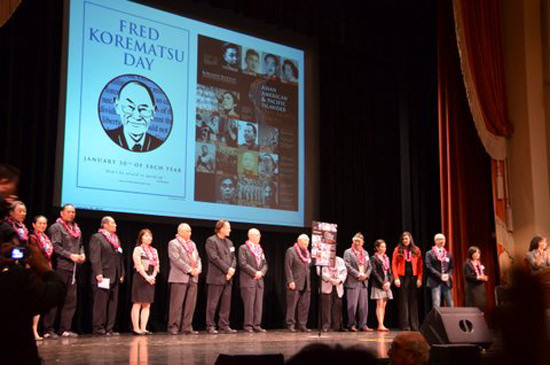 Indeed, telling the stories of other Asian Americans who stood up for justice was the big deal at this year’s Fred T. Korematsu Day celebration. “With Fred T. Korematsu Day in California, it not only lets us tell his story for his struggle for justice and the Japanese American internment, but also to educate people about everyone else’s struggle for justice and their stories of standing up for what is right,” said Korematsu’s daughter, Karen. Karen liked my idea of an ongoing “Hall of Fame,” or a shrine memorializing the honorees. But she says her life mission at the moment is to make Korematsu Day a national holiday. Jan. 30th, Fred Korematsu’s birthday, is already recognized in California, Utah, and this year in Hawaii. The list of honorees at this year’s event included Wong Kim Ark, the Chinese American whose case is the basis for birthright citizenship in the U.S. It included Larry Itliong and Philip Vera Cruz, who organized farm laborers in California but have been unfairly put in the shadow of Cesar Chavez. There were the Japanese Americans of the U.S. Army’s 442nd Regimental Combat Team and their legendary “Go for Broke” battle cry. And there were the Filipino “Veteranos” of WWII, many of them Filipino Scouts, who fought side by side with the U.S. Army, but still continue a fight for pay equity to this day. Included in the “veterano” group was one Lourdes Poblete, 88, who was a Filipino guerrilla fighter at age 18. She was captured and held in a concentration camp for six months. Nothing these honorees did or were forced to endure was easy. It all took a lot of courage and guts. And so while the scions took the stage to stand in for their heroic forebears, it all made me wonder if those of us in later generations have done our share. In light of Asian Americans, the “model minority,” with the highest incomes per racial group, known for our docility and quiet demeanor, have we lived up to our heroes’ examples? Have those of us in subsequent generations done enough and met the challenge of our rich history of activists and troublemakers? Or has our relative prosperity made us too comfortably complacent? I posed the question to Dale Minami, a key attorney in the legal team that overturned Korematsu’s conviction forty years after the Supreme Court decision. And now we have a list of people to emulate. FRED KOREMATSU: Plaintiff who challenged the WWII incarceration of Japanese Americans in the US Supreme Court. Karen Korematsu represented her father. GRACE LEE BOGGS: Chinese American grassroots activist for pan-ethnic social justice movements. Ms. Boggs was unable to attend. MITSUYE ENDO: Plaintiff who challenged the WWII incarceration of Japanese Americans in the US Supreme Court. Wayne Tsutsumi and Wendy Weiner represented their mother. FILIPINO WWII VETERANOS: Filipino soldiers who fought for the US against Japanese forces during WWII but were later denied US military benefits. Veterano Alberto Saldajeno represented this honoree group. GORDON HIRABAYASHI: Plaintiff who challenged the WWII incarceration of Japanese Americans in the US Supreme Court. Jay Hirabayashi represented his father. INTERNMENT DISSENTERS: “No-Nos,” draft resisters and renunciants who challenged the WWII incarceration and mistreatment of Japanese Americans. “No-No” Hiroshi Kashiwagi represented this honoree group. LARRY ITLIONG: Filipino American organizer and coalition builder in California’s farm labor movement. Johnny Itliong represented his father. JAPANESE AMERICAN WWII VETERANS: Soldiers who fought bravely in segregated WWII military units in the face of racism at home. MIS veteran Asa Hanamoto represented this honoree group. YURI KOCHIYAMA: Japanese American grassroots activist for pan-ethnic social justice movements. Audee Kochiyama Holman represented her mother. QUEEN LILI’UOKALANI: Last reigning monarch of the Kingdom of Hawaii and advocate for Hawaiian sovereignty. Unfortunately, relatives of the Queen were unable to attend the event. DOLLAR STORE STRIKERS: Women labor activists who launched one of the longest-running strikes in San Francisco’s Chinatown. Mervyn Lee, son of striker Sue Ko Lee, represented this honoree group. MAMIE TAPE: Chinese American child plaintiff in landmark case reinforcing equal access to education. Alisa Kim represented her aunt. BHAGAT SINGH THIND: Sikh American plaintiff in US Supreme Court case examining race-based citizenship. David Bhagat Thind represented his father. PHILIP VERA CRUZ: Filipino American founding member of the United Farm Workers and defend er of workers’ rights. Fernando Gapasin represented his uncle. WONG KIM ARK: Chinese American plaintiff in US Supreme Court case affirming birthright citizenship. Gary Wong represented his grandfather. MIN YASUI: Plaintiff who challenged the WWII incarceration of Japanese Americans in the US Supreme Court. Serena Hawkins-Schletzbaum and Chani Hawkins-Walker represented their grandfather. 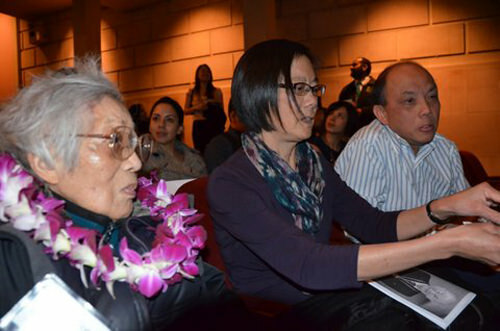 Mabel Fong, 98, a National Dollar striker, with her daughter-in-law Karen, and son, Jeff, at the Korematsu Day program in San Francisco. Honorees and their family representatives at the Korematsu Day “Heroes” celebration at the Herbst Theatre, San Francisco. Karen Korematsu, daughter of Fred, with Johnny Itliong, son of honoree Larry Itliong. Lourdes Poblete was 18 years old when she was placed in a concentration camp in the Philippines during World War II.